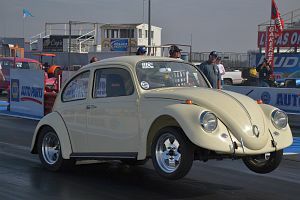 Click on a picture for a large size image. 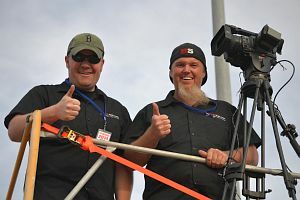 Brian Lohnes and Chad (pictured right) are Bangshift.com which webcasts the March Meet, California Hot Rod Reunion and doorslammer meets from the US. 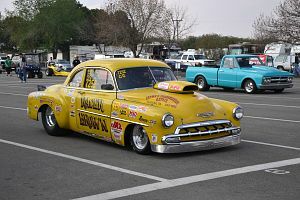 Sandy Mendia is the driver of this clean Ford in Hot Rod. 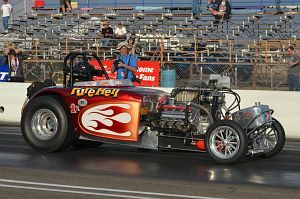 This dragster based on a midget racer also runs in Hot Rod. 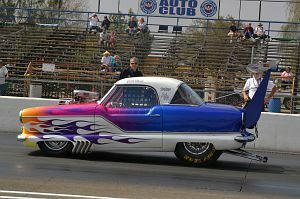 Nash Metropolitan sold in the UK in the early 60s, here Gabe Wood has modified it for A/G competition. 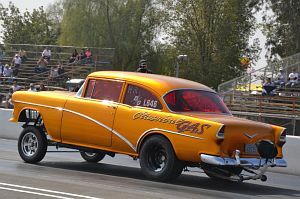 This Chevy Gasser runs in Hot Rod. 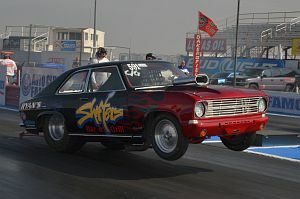 John Ryan's Opel from '68 runs a 377 chevy but he is on the wrong side of the dial-in with a 9.58. 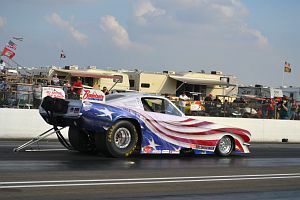 This immaculate altered of Ron Anzalone runs a 6 cyl Chevy 300 cu in and is also on the wrong side of the dial which is 9.60. 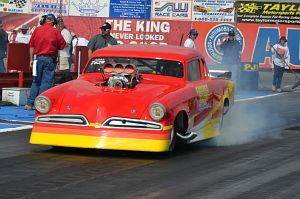 Terry Newton qualified the '53 Studebaker fifth with a 7.639 on the 7.60 dial in. 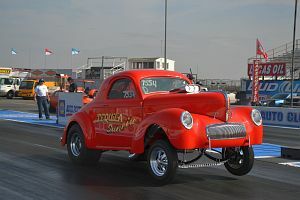 This immaculate Topolino went a few yards, after which it was clear that oil had been spilt. 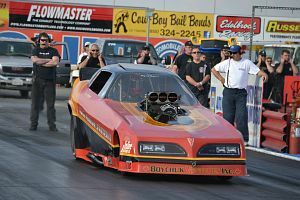 Mike Pawluk ran a high six to qualify 9th on day one. 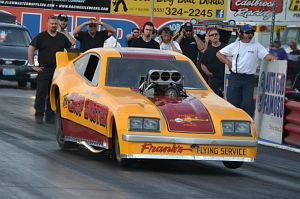 Today's Nostalgia FC and Top Fuel runs were on a test and tune basis. 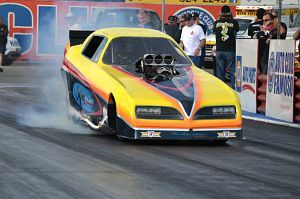 The rewrapped Nostalgia FC driven by Tim Boychuck has Roland Leong as crew chief. 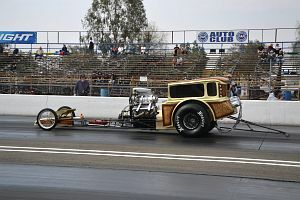 Don Nelson's California Hustler has a paint job designed by the great Kenny Youngblood. 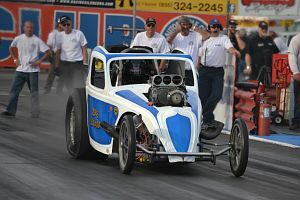 The Frank Ousley-owned and tuned Mopar “Crop Duster has a new body for 2014. 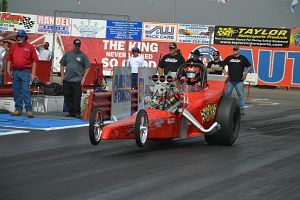 Mike Sullivan's fuel altered from the late 1960s is now driven by Mike's son Jeremy, who ran a solid mid-six in testing. 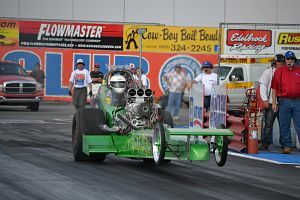 The Witch Doctor Fuel Altered is piloted by Keith Wilson. 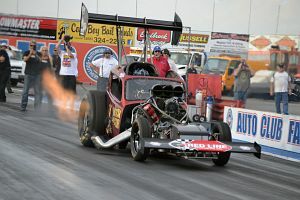 Pure Hell ran a 6.20/215 to belie its old-school appearance. 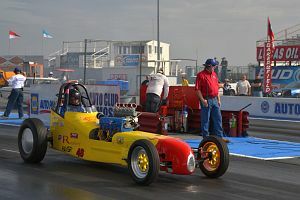 Pure Heaven III is also racing under a traditional appearance. 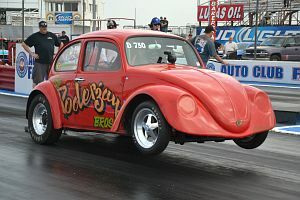 Steve Poderzay's VW is a '66 model. 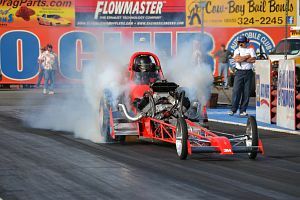 Allen Wiess ran a 10.71 in D/Gas. 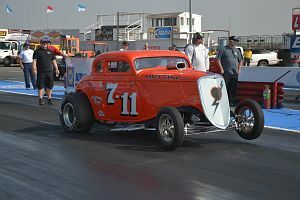 Tim Avila has been racing this immaculate Willys for forty years and it has a Chevy 350cu in engine. 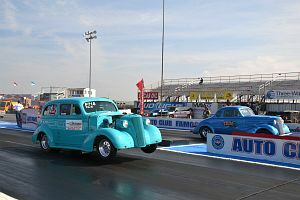 This old-school match up is between two Ford rods in D/Gas. 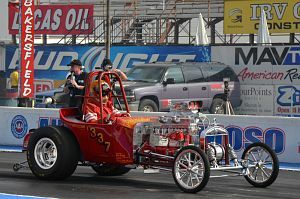 This rod ran an under-the-index of 9.41. 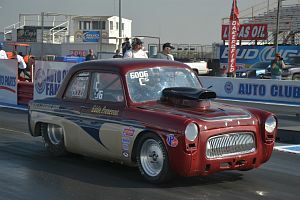 A UK '59 Ford Anglia is driven by Eddie Prenevost and recorded a 9.70 with a Pontiac engine under the hood. 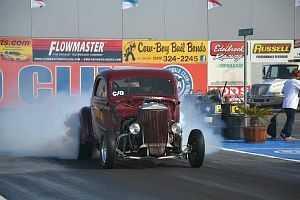 Troy Moyle is the driver of this '34 5 window Ford and run a 9.86..
Another fine example of a Competition Coupe, a type of vehicle that in the 1960s had a class to itself. 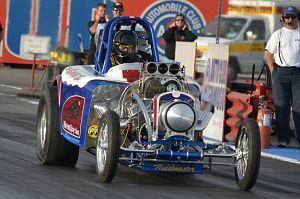 The Hall Brothers ran a quick pass in a car that was neither a conventional dragster or altered. 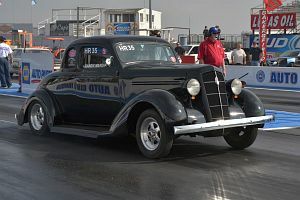 This Chevrolet Business Coupe ran an under the index of 9.41 in C/Gas to qualify 34th. 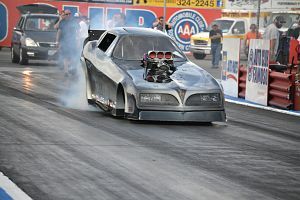 Errol Sharron ran a 7.19 to go 11th in 7.0 pro. 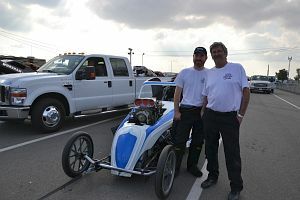 Mike Sullivan and son Jeremy stand by the iconic altered which won Super Eliminator at Indy in '70. 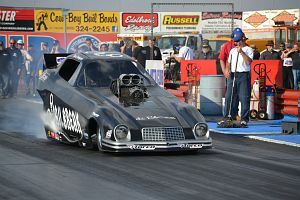 Brad Thompson had a few problems with the Jailbreak funny car but has run 5.6s in past events. 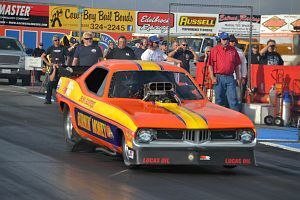 Bob Godfrey's Burnin' Money 'Cuda FC has a beautiful new paint job..
Mike Tocco & Roger Gartern's War Horse Mustang came back in 2010 after a 30 year hiatus. 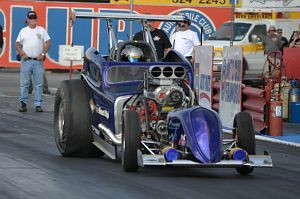 Dan Horan ran the quickest time of the day with a 5.76/254 pass. 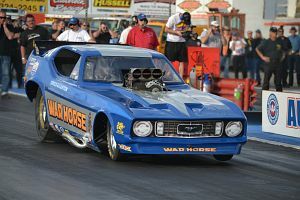 Tim Nemeth, based in Western Canada drives his '77 Cuda.